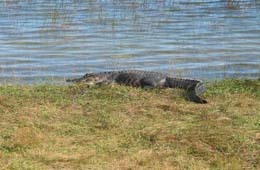 Miami Beach 411 : Advice : Tours : Search results for Everglades National Park : Click the links below for info about the National Park. The Park contains tropical plant communities, including saw grass prairies, mangrove swamps and pinelands, as well as marine and estuarine environments. It is also the only place in the world where alligators and crocodiles exist side by side. The park may be explored by personal vehicle, tour bus, bicycle, motor boat, or canoe. Most areas of the Park are handicapped accessible. Flamingo and Long Pine Key Campgrounds are open all year. Make Reservations by phone at (800) 365-CAMP.